), the other says CV can't find the .hex file. They are both where they are supposed to be. I apologize in advance for not disclosing the code. It is a project for a yet to be patented device, and I have signed a non-disclosure contract. I am hoping this is a problem that could be caused by a limited list of issues, and that some of you have some suggestions. I realise suggestions will be shots in the dark under these circumstances, but as I am new to both Atmel Studio and CV, anything I could try would be welcome. CodeVision seems to be looking along the correct path, as in the path where all the project files are located. The project has builded previously without problems, at the same location. Could it be that I messed up with #includes? I noticed while researching that there are different rules for linking project files in Atmel Studio and CodeVision, and prior to this project I am new to both. This started out as a project in Atmel Studio, and has later been merged into a CV project. Three different people each with their own macros etc. have contributed to the project. It is a project consisting of 3 .c files, 12 header files and 3 list files, some of whom originated in Atmel Studio. I don't know if that is capable of creating this kind of problem, though. So any pointer in which direction I should look for a problem would be helpful. So you are merging a .ROM file with the .hex file generated by the compiler so that you can program a bootloader at the same time as the application? (Or, if not a bootloader then some fixed data). The project is supposed to run on an Atmega324PB MCU, through an Atmel ICE. 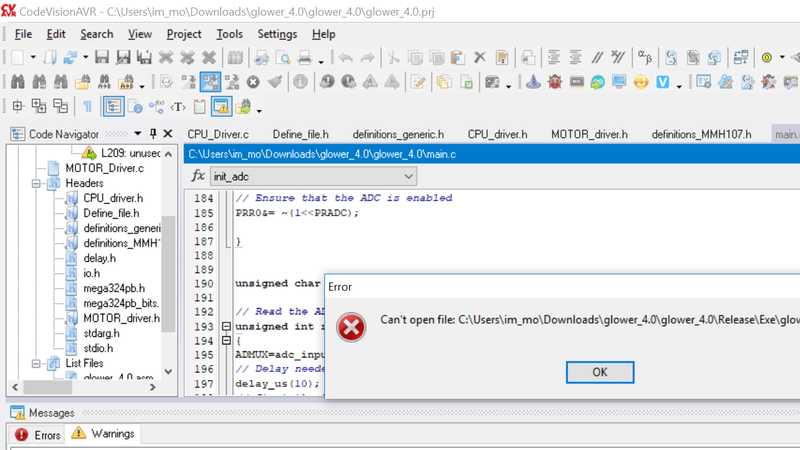 I open the project in Atmel Studio to send it to the ICE, but first I have to get it to build in CV (right? Or could I build the saved project it in Atmel Studio instead? I find the interaction between these programs confusing, to be honest). I just click the build project button in CV, as before, not sure what that does behind the scenes. Forget Studio for the moment. Can you open the project in the Codevision IDE and compile it without any errors? If the ROM file error appears then go to Project>Configure>After Build. I'm guessing that the 'merge rom file...' option is ticked and a file is specified in the selection box. It opens and compiles without errors in the CodeVision IDE, yes. Thank you, I will try that as soon as I get home! (Am currently on the bus). After build was set to "do nothing", but the CodeVision support team figured out that the problem was the name of the project. It had a dot in it, and that confused the compiler. Solved by changing project name from "glower_4.0" to "glower_4_0". Excellent news. And that's why I happily pay each year for my Codevision support.